A longtime staple of playgrounds, lunchboxes, after-school snacks, and college dorms, a Fluffernutter is the wonderful combination of marshmallow creme (aka FLUFF!) and peanut butter in a delightfully tasty sandwich! So, how about making Fluffernutters in the form of a cookie? Though probably not the first to come up with this idea, my sister, Cathy, was the one who suggested them to me. She was reading my recipe post for Peanut Butter Cake where I added the tip of sandwiching the Fluff between the layers of cake. She thought, "Why not sandwich the Fluff between two peanut butter cookies instead?" Fabulous. So, then I did a little googling and found that there are several versions of Fluffernutter cookies. Some have the Fluff on top, (like a thumbprint cookie), some have the Fluff baked right into the cookie. One of the most popular recipes only has THREE ingredients, two of which are the peanut butter and Fluff! Crazy, huh? Well, after several discussions with Fluffernutter enthusiasts, (Denny, Michael, Katie, Kelsie, Jackie, and Joshua, to name a few), I decided that this was the version for me (based, of course, on Cathy's original suggestion and also on how much you could taste the Fluff). 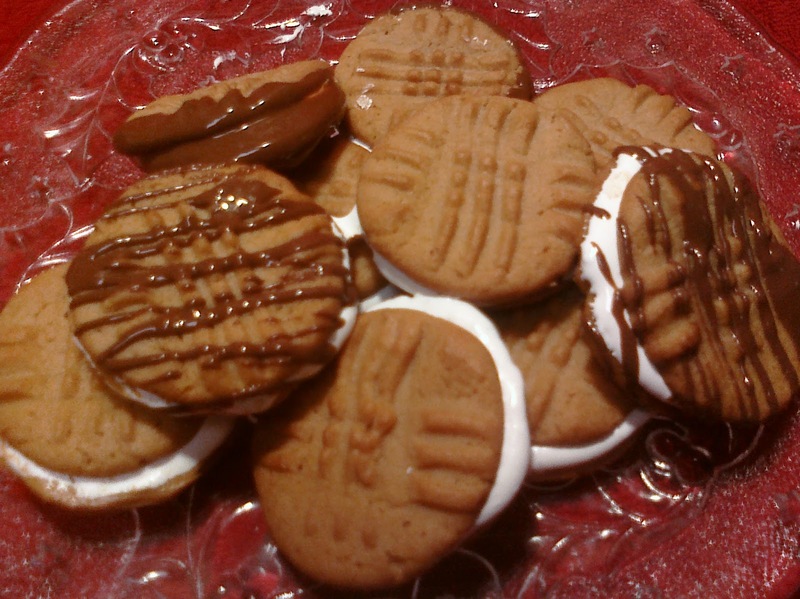 Just bake up some of your favorite peanut butter cookies, and then sandwich the Fluff between them. Its brilliance is in its simplicity. The addition of a chocolate drizzle just sends it over the top! This recipe is from my favorite Mrs. Fields' Cookie Book , but use whichever recipe you like best! Your family will devour them! On medium speed, in large bowl, blend sugars; add butter, mix till grainy consistency. Add eggs, peanut butter and vanilla extract; beat until fluffy. On low speed, add flour mixture until barely mixed into butter mixture. Drop by rounded tablespoonsful, 2 inches apart on ungreased cookie sheet. Use a wet or flour coated fork to gently press a crisscross pattern on top of each cookie, if desired. Bake until the edges of the cookies are lightly browned, approximately 18 to 20 minutes. Remove to cool on a flat surface. Just melt one or two large Hershey bars with about a tablespoon of plain vegetable shortening in the microwave. Mix until smooth, then drizzle the top or dip one side of the cookies. The chocolate will set up, but it'll still be soft. If you'd like the chocolate to set up to a harder shell, use dipping chocolate, as one would use for making candy. To save time, you can certainly take a shortcut buy using ready made peanut butter cookie dough, instead of mixing up your own. You really can't go wrong with Pillsbury or Nestle. Just sayin'. Although the recipe says to drop by rounded tablespoonfuls, I'd suggest making smaller cookies. Instead, use maybe 2 teaspoonfuls for each cookie. Remember, you're using two of them for each serving. Then again, if you'd like gigantic sandwich cookies, go for it! To make the cookies extra Fluffernutterier, just add peanut butter to the sandwich! Simply place a teaspoon of peanut butter on one cookie and a teaspoon of Fluff on another, then sandwich the two together. More is more!